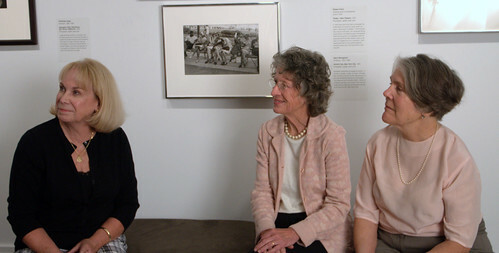 Thanks to LPV for tweeting how Chuck Patch came across these three women from Winogrand’s 1964 World’s Fair photo a few weeks ago at the Boston Museum of Fine Arts! My understanding (and I was trying not to disrupt the shoot/interview, which I clearly was) is that one of them spotted the picture a few months ago and for some reason contacted the museum (I’m assuming that they saw some advance notice for the exhibition). None of them had ever seen the picture before and had no idea that it’s so famous. When I said I first saw it in 1972 in the Time-Life “Library of Photography” one of them said, “it’s been around that long?” I think the MFA will release a story to the Boston Globe and also post it on one of the museum blogs.